Hi there, thanks for stopping by! I’m continuing along on my mission of furnishing my house without spending much money. 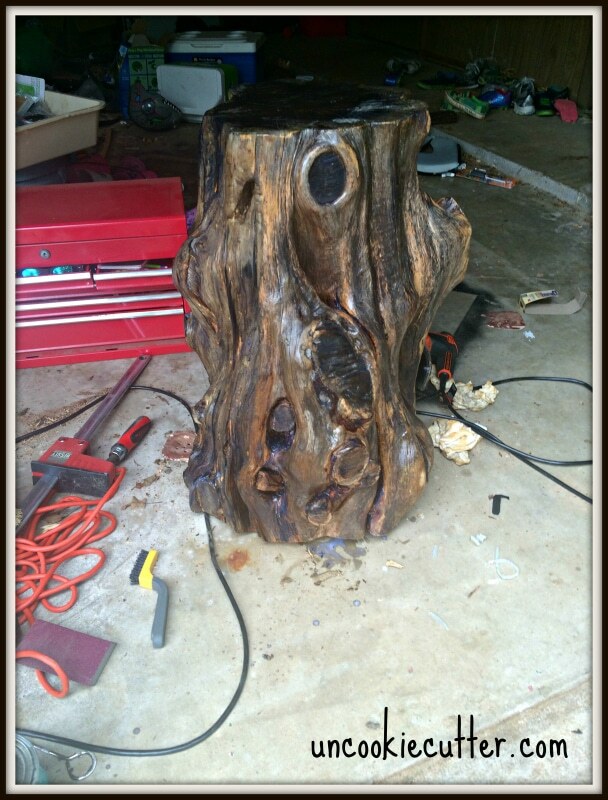 When I saw an old tree stump in the yard that was just the right size, I used it to make a fun converstional piece. This project was very cheap, but I made plenty of mistakes along the way! I have my chair angled to see the TV, so that the space between the chair and the couch was tiny and odd. I thought about building a triangular shaped small table to go there, but just couldn’t picture it. I actually drew some stuff out and thought about it for a while and couldn’t quite figure out how I wanted to fill this odd space. We just needed a little something to set a drink on. 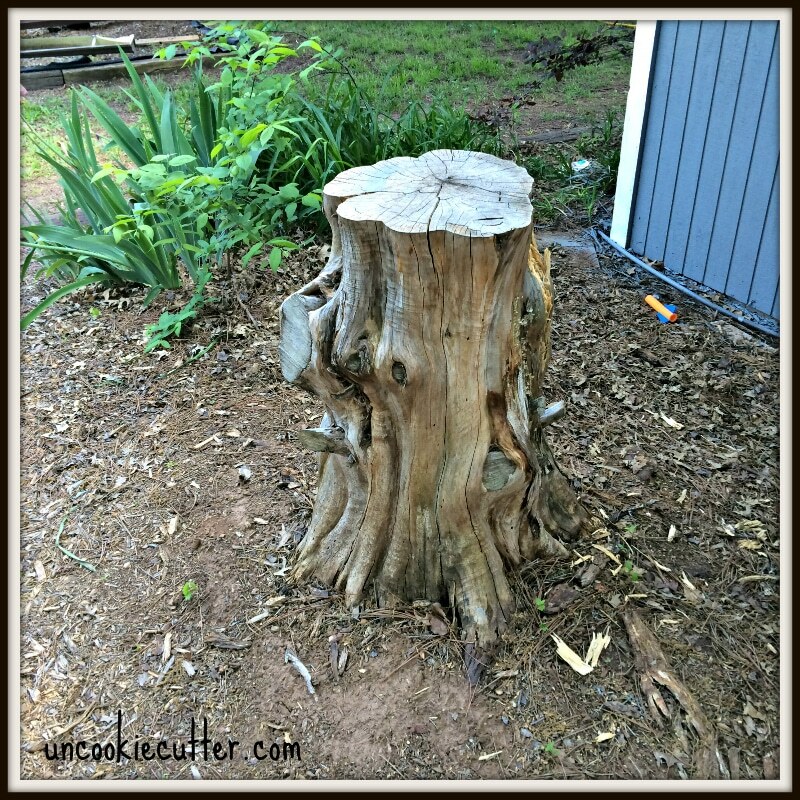 In a completely different train of thought, I kept looking at this beautiful stump sitting in my yard and wondering what I could do with it. I was way to excited about this stump, ask anyone who knows me. Sooo pretty! However, it took way to long for me too realize that it was the perfect size and shape for an end table. I have a lot going on in this house, haha. So, we cut it down. And then I ran into a whole bunch of issues. Read on to see what happened, but all in all I still ended up with a unique little piece for about $20. The first problem I ran into was that the side of the stump that faced the house didn’t get any sun, and therefore was wet. 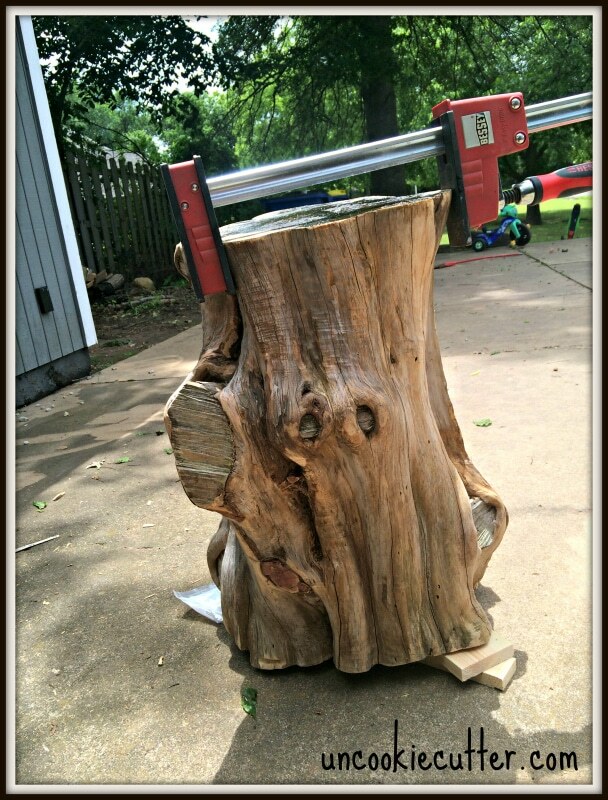 The beautiful bark was flaking off and I knew it would take a long time to dry without a fancy wood drier, which I don’t own. Also, some mold :(. I’m not a very patient person, but I also realized the area that was wet wasn’t very deep at all, so I decided I would just take that side off. I ran into my first problem here. I decided to wrap it in a tarp for a week or so. In my mind, this would dry it out and kill any bugs in there. Looking back I have no idea why I thought either of those things would happen. When I took it out, it was way moldier. I felt really, really smart at that point. So, then I spent a lot of time scrapping of mold. Then I pulled, flaked and sawed off the wet areas. 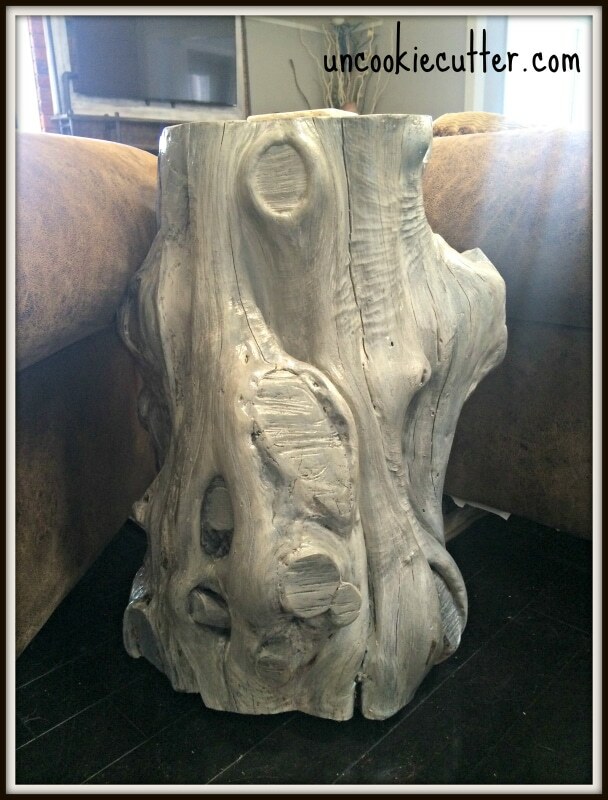 Already the $250 tree stump end table I found HERE seemed a little more reasonably priced than I first thought. I was still a little concerned about bugs. 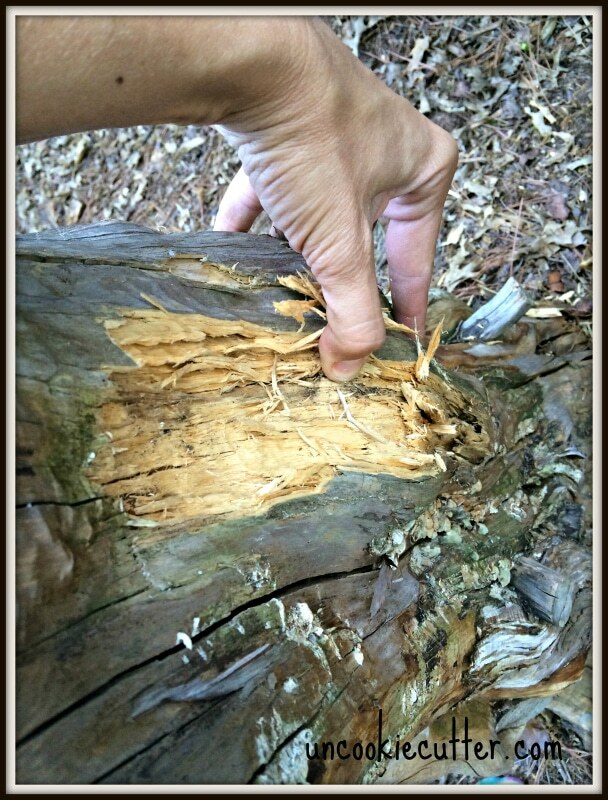 I had a neighbor tell me this was cedar and bugs don’t live in cedar. 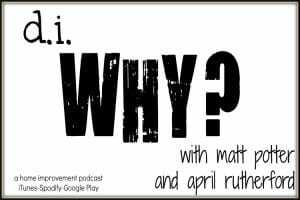 I also read that once you start working on a piece, sanding and what not, that they don’t want to be there anymore, but I still wanted to make double sure we didn’t bring any unwanted friends into the house. So I called the bug guy. I told him we needed him to come out a month early, because we had been finding more spiders in the house, which wasn’t a total lie. While he was here, I casually (ahem) asked him about it. He was very nice, looked it over and said there was no evidence of any sort of infestation, but I asked if he would go ahead an spray it anyway. He was very nice, and hit it with his bug juice pretty well. Now it was time to sand. And saw. And sand and sand and sand. Lots of sanding. And sawing. Lots. Again, $250 looking better. The stump also had a huge crack in the top that I was a little worried about, so somewhere along the way I used some epoxy to just make sure it didn’t split. .So, now she was all smooth, glued and trimmed. I call her she. I wanted the trimmed off side to match the other side, so I stained it with a mixture of steel wool, cider vinegar and coffee grounds. I found the recipe HERE. Two coats and she turned out perfect! Now I was excited, a couple of coats of poly and I should be done. Except this is what happened when I put poly on. .I have never had Polycrylic turn anything before. Don’t know if it was the stain, the bug juice or just the cedar itself, but this color wouldn’t work in my room. I’m pretty sure it wasn’t the stain, because I only used it on one side. I was very sad at this point and wasn’t sure if I was still going to use it or not. 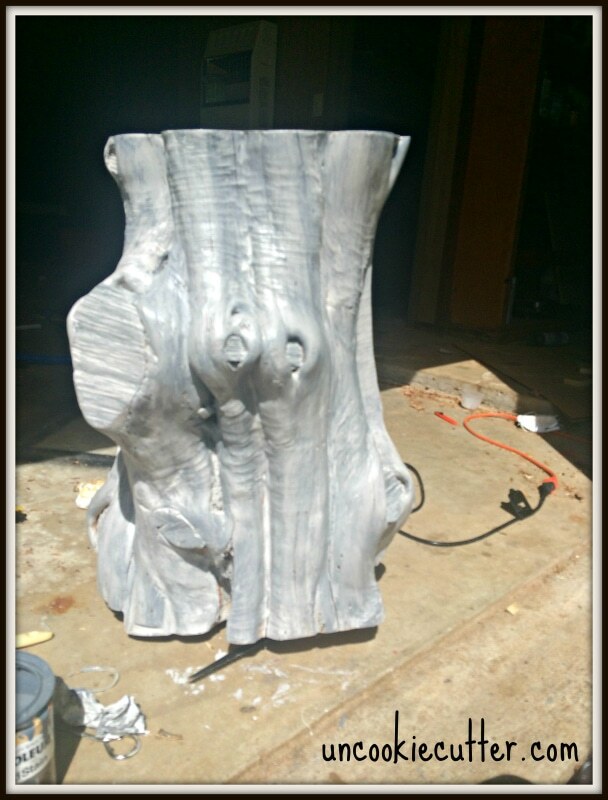 The bark is so tender and soft I knew I couldn’t sand off the poly, so I decided to try and salvage it. I painted it the same color I did my walls which turned out way too white. I added some Ebony stain to try and make it a little more toned down and natural looking (ha!). Then I added the poly again. This time it didn’t turn. So, I didn’t get the beautiful natural look I wanted, but I’m still digging it. Here are some more pics of it all finished. She does fit perfectly in the space. Anyway, after all that I am still happy. I spent probably about $20 or less on Poly, stain and sand paper. 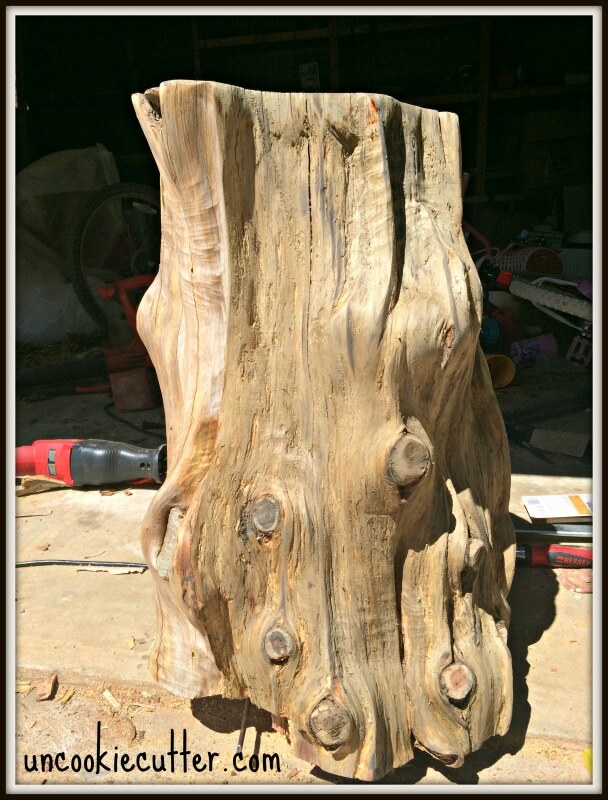 Not too shabby, but if you aren’t lucky enough to have a tree stump like this just sitting in your yard like I did, you can actually buy a cedar stump end table on Etsy HERE. Little update, I forgot to mention I put some furniture feet levelers on the bottom. I used 3, which was less than $5, so around $25 is probably a better estimate. If anybody has any tips on all the things I did wrong, let me know in the comments! I’d love the feedback. So, my living room is coming along. Now I really am going to put something on those walls! 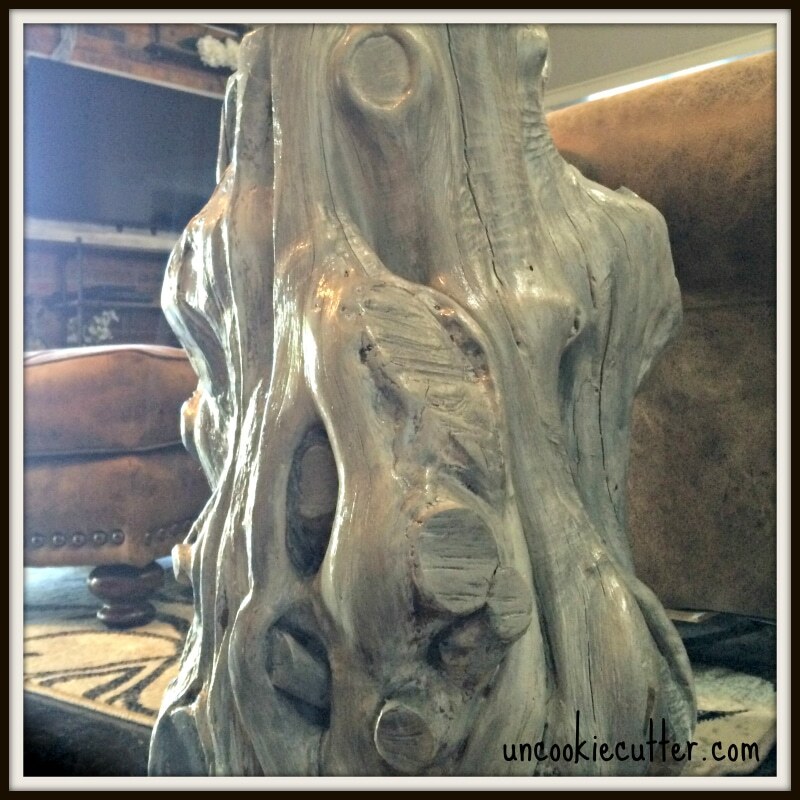 Have you used a tree stump for any sort of decor? I would love to see it! How fun! I love the color that you made it! It’s so rustic and unique! Thanks Emily, it’s nice to hear. I looked and worked on this so much I’m actually still not sure what I’m seeing, haha. I think I’m going to love it once the letdown wears off ;). $250 wasn’t sounding too bad LOL that was a lot of work but definitely worth it. 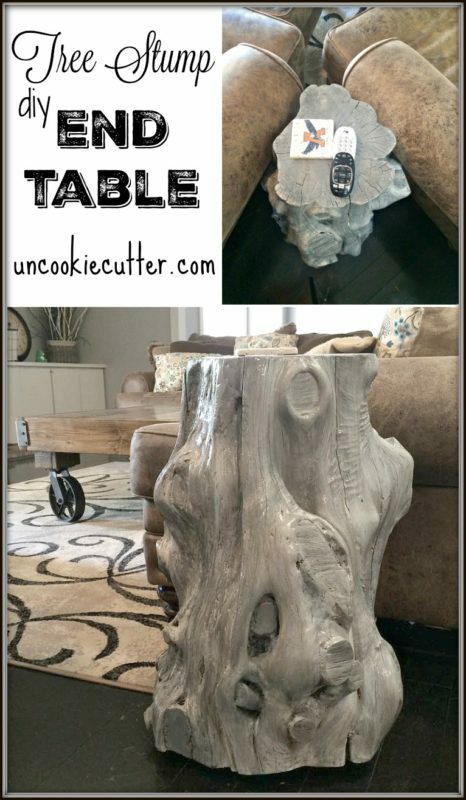 What a great unique and rustic piece. Thanks Sara! I do love it now. Now that we are over our lovers spat ;). 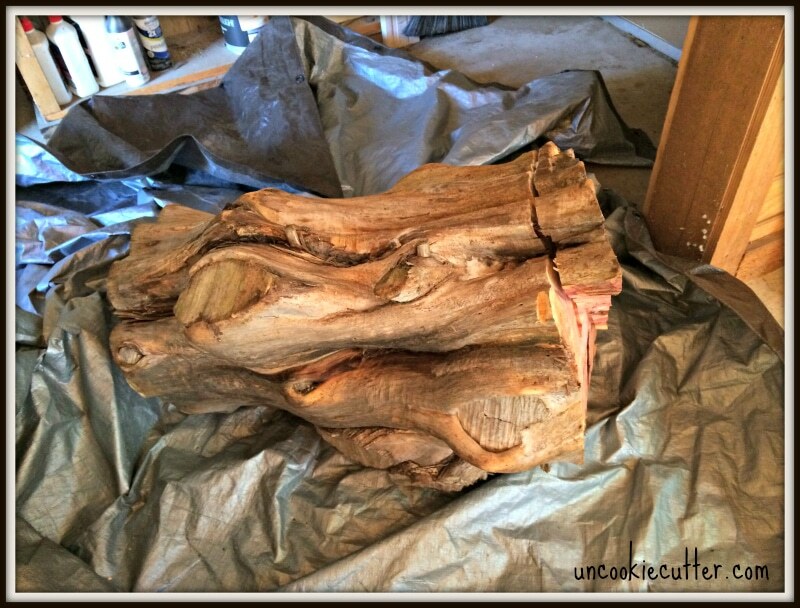 I loved seeing the process you went through to create the table, and I think it is perfect for the space. Yes! Picked it up at Wal Mart for like $30 or so. I was going to make one similar, but for that price I thought it was worth it. Come on over anytime! Haha and you have will power. I would of thrown it in the trash half way through. Lol. Haha, I almost did that about 7 times :). oooohhhh, I love it! Turned out awesome! How clever to fit something so artistic and beautiful in a spot that needed something! 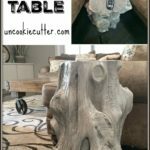 That table turned out beautiful! You are so crafty and artistic. 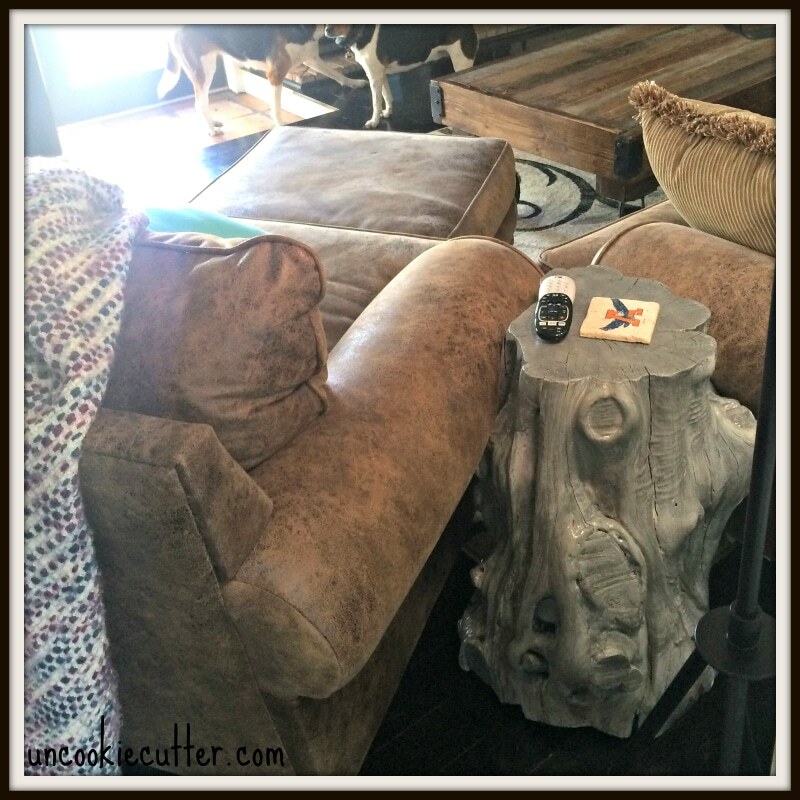 Love the thick coffee table in the pic too! Thanks Allison! 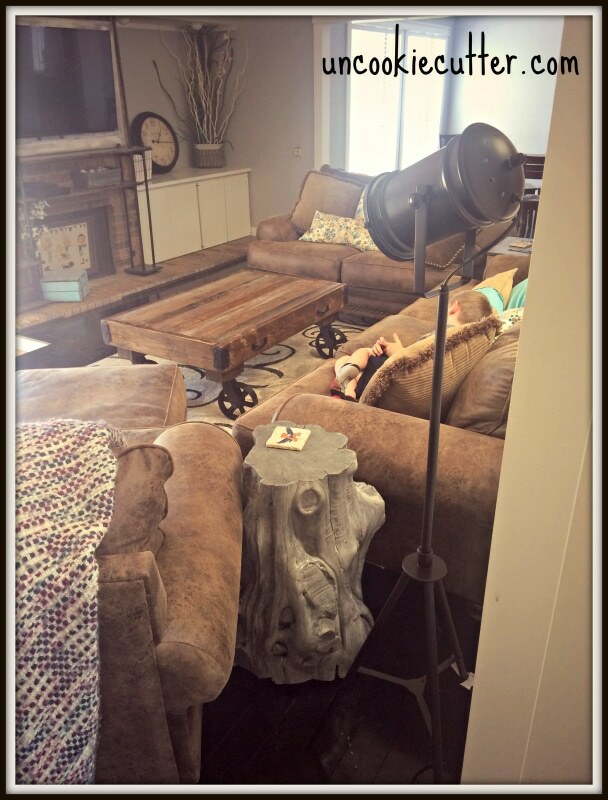 The coffee table is probably my favorite piece of furniture! Thanks for stopping by! How awesome! I think “she” turned out pretty cool! Very cool project- and thrifty too! 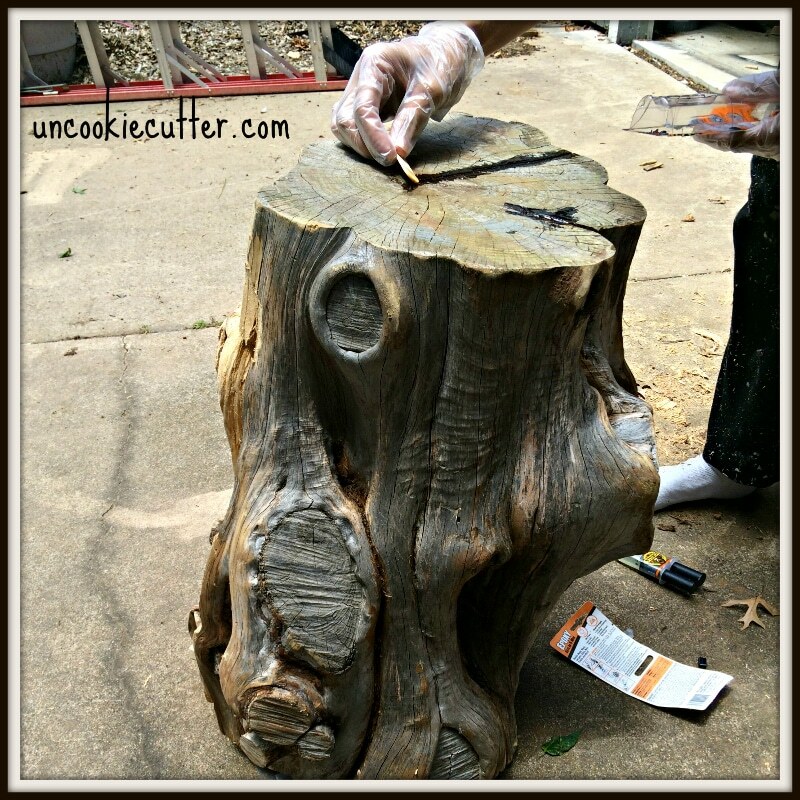 We used to have an old stump sitting in our yard and we used it as a seat or a table all the time. I never thought of bringing it in the house! Wow! It turned out beautiful! I would have never thought of that. You are very talented, April. Thanks! I’m not going to lie, for months I thought, what I am going to put there and what should I do with this stump before putting them together! I like it. 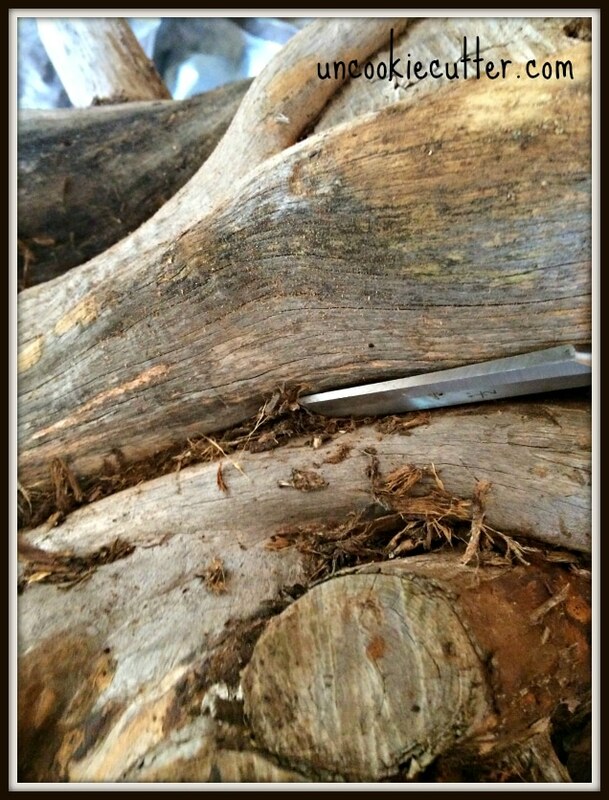 What a cool way to use and old stump. Amazing, amazing! I can definitely see how much time and effort you put into the project. Well done! You are amazing – I’m in awe! Love it!!! Thanks :). You’re amazing. Can. not. wait. 21 days. Love this! I have actually always wanted to do this, although I am not as crafty as you are! Wow! Amazing post! Loved the make over of the tree bark into something so pretty and useful. I love this on so many levels! Thanks for sharing! Pinned! OMG! Love!! This is so creative. What a great way to bring a little nature inside. Very cool idea! Love the way it came out! It is Beautiful! I admire your patience, and craftsmanship! Your table would probably be worth a lot more than $250 dollars. And I think it would blend in any decor because of the color! Love it! It is Beautiful! I admire your patience and craftsmanship! Your table I am sure would be worth more than $250. I think it would blend very well in any decor because of the color. Just love it! I love your table . I was amazed at how much work you put into it . In my innocence I just thought you cut it down and put it in the room ! How wrong I was . I hope you enjoy it for many years. The color of your totally cool stump looks as though it has spent years on the beach, being bleached by the sea water and the sun – AWESOME!!! 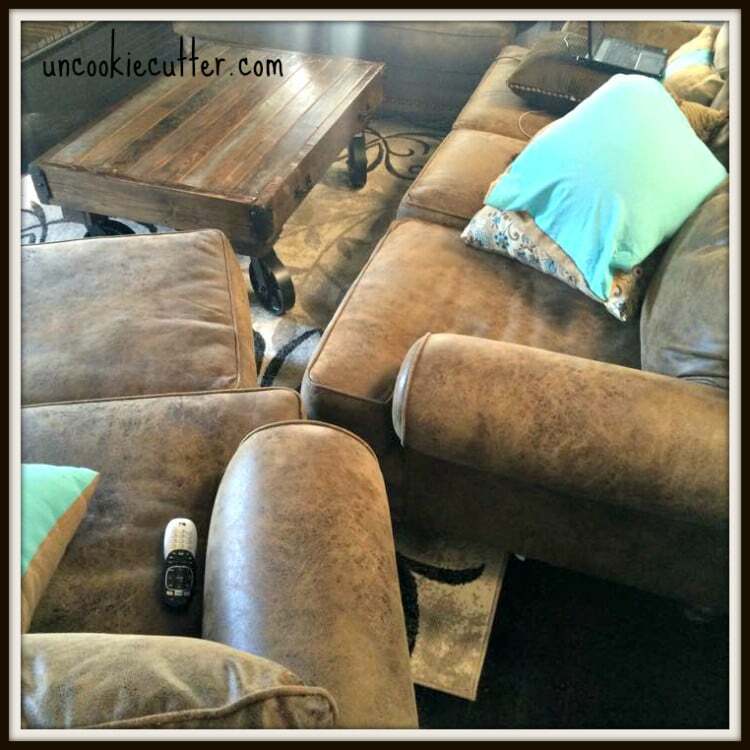 I thought the color was on purpose – looks perfect in your living room!!! Oh thank you Susan! That is great to hear, I never thought about the sea water effect. Thanks for stopping by! Way to pretty to hide between the chairs. Way too pretty. English teacher gone mad. Thanks Vicky, I feel the same way, works perfect for what I need it for, but wishing it wasn’t so hidden. Thanks for stopping by!! Such a cool table. It looks like it was worth the hassle. Wow! This looks awesome – it was well worth all the time you put into it! It was fun to see all the stages it went through!! I added it to Stumble Upon the other day and yesterday I got an email that it already had over 50 likes, in one day! Thanks for sharing at Dream. Create. Inspire. Link. Hopefullly you’ll join us again tonight! Wow!! Thanks Jenny! I have to figure out Stumpleupon, I hear it gets great results but have no idea how to use it. I’m heading over to the link party now, thanks for coming by! 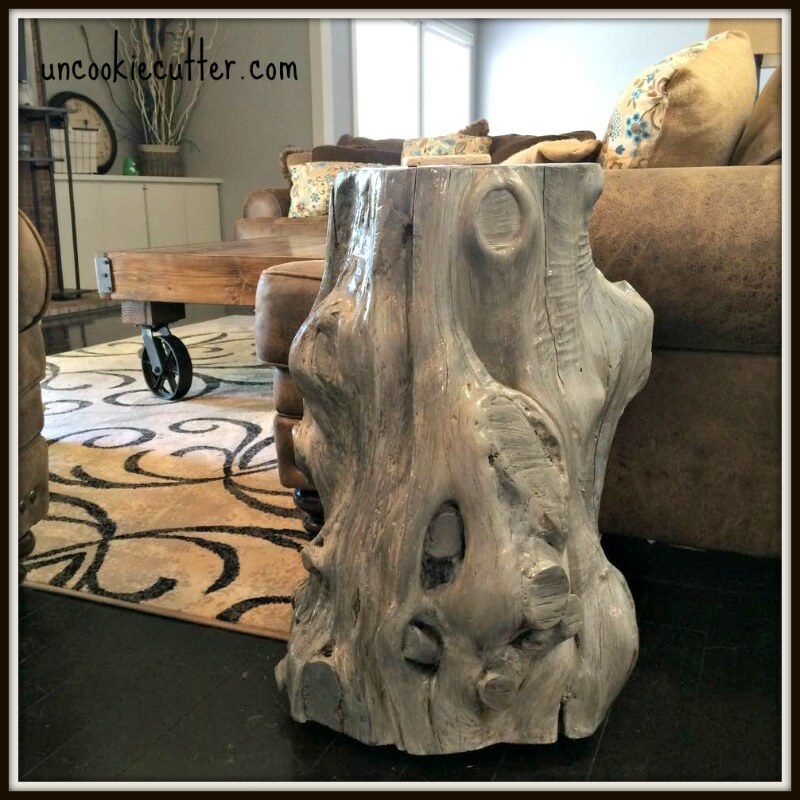 I’m considering making something similar, but I have a product called pentacryl that treats the wood. We’ll see how it goes. 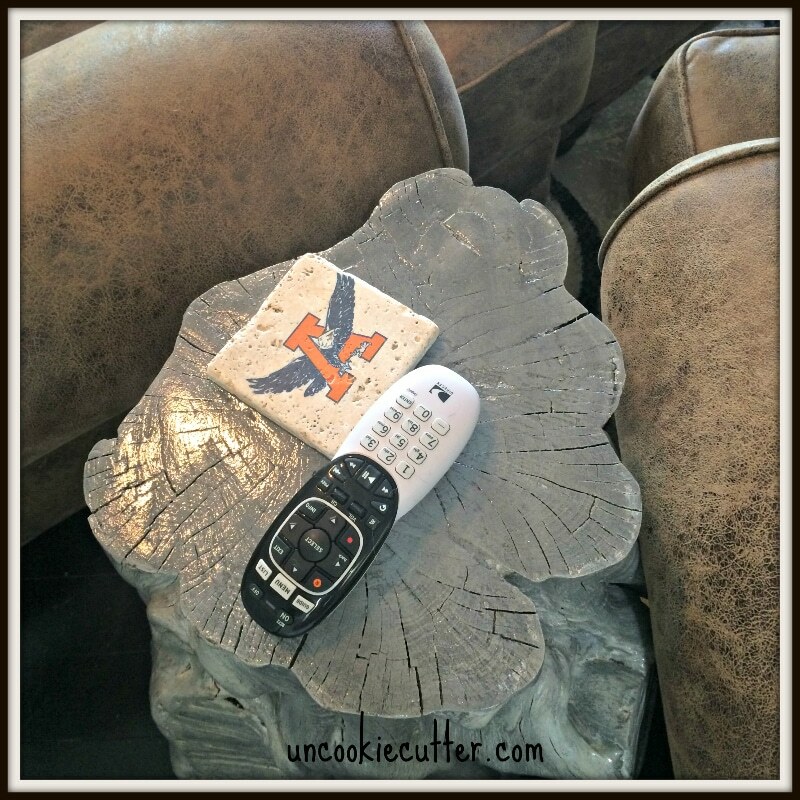 Thanks for linking up to the Blogger Brags pinterest party. I have pinned your post to the Blogger Brags pinterest board. 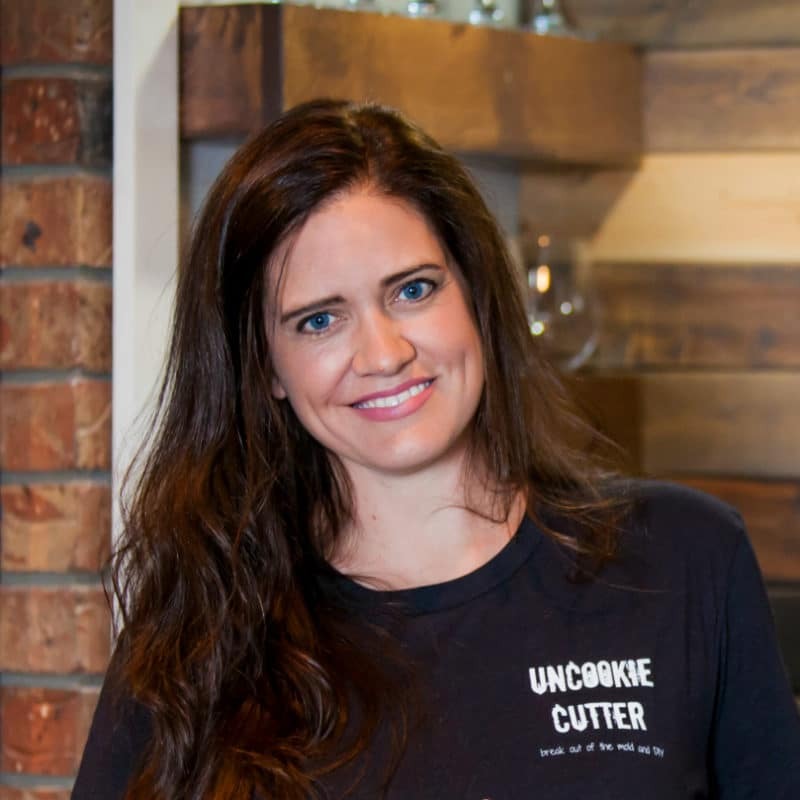 Thanks Sarah, can’t wait to see your table! Thanks for stopping by! How exciting, thank you so much! Headed over now! 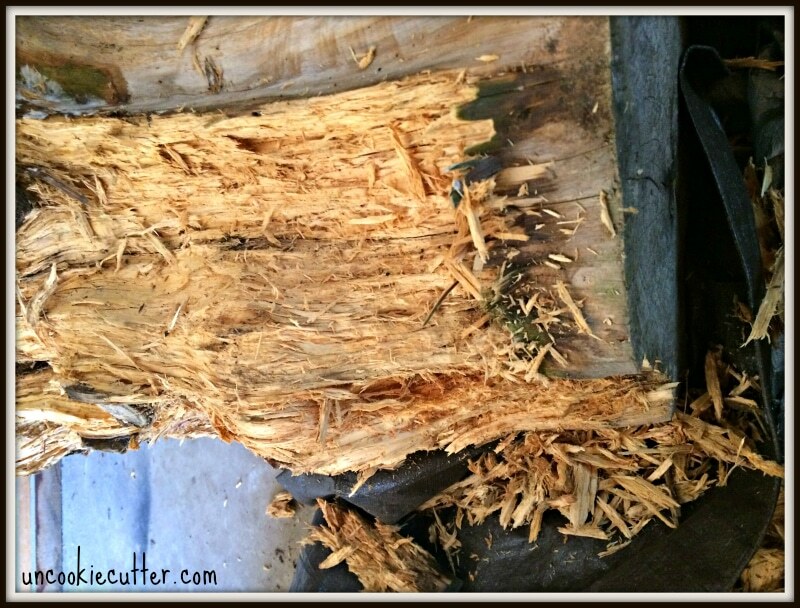 For a fast way to remove the old rotted wood, bark, dirt, bugs etc from the outside, a water blaster would work well. We have a high pressure petrol powered one, and it makes short work of that sort of thing (as long as I don’t get too close and bore a hole in the actual wood, that is…). Of course, then you have to let it dry again which may take a while, so it’s a method to plan well in advance for, but it works nicely and can do a good job of bringing out the grain and knots.